The complex interactions between floods and society are currently being investigated at TU Wien. The economy needs the central government to organise flood protection. Humans have an impact on water sources through dams, regulations and agriculture. And the risk of flooding affects society and economic decisions. The complicated interplay of these factors is being investigated at TU Wien. The mathematical economist Johanna Grames has developed conceptual models to describe economic decisions for long-term flood protection strategies. Private businesses should not shoulder the responsibility for flood protection alone. In prosperous countries in particular, it makes sense for central government to establish the necessary infrastructure for flood protection. "The field of hydrology has been investigating the impact of agriculture and building work on the risk of flooding for decades," says Johanna Grames. "But research on the two-way interactions between water systems and society is an extremely young field of research. Implementing these interactions is important to make the right decisions in the long term." How do people behave if flood risk decreases as a result of dams? Should capital-intensive businesses be located in flood risk areas and increase flood protection, or should they be (re)located to areas that are less vulnerable to flooding? Johanna Grames investigated these questions as part of her Ph.D. thesis supervised by Prof. Alexia Fürnkranz-Prskawetz at the Institute of Stochastics and Mathematical Methods in Economics at TU Wien. Mathematical and economic analyses have shown that both central government and the private sector have an important role to play in flood protection. "Companies naturally want to reduce their own risks. The risk depends on the probability that a dangerous flood occurs, and on the capital that is at risk. Therefore, investments made to avert possible flood damage might not pay off, even if they are subsidised by the central government," explains Johanna Grames. Thus, it makes economic sense for the central government to provide long-term flood protection. "Each party should focus on what they can do best," Grames stresses, "Central government is best at building infrastructure, and private companies can then be sure that their investments are not at high risk." The calculations also show that government investment in infrastructure is better than direct subsidies to companies. Direct subsidies are not invested in flood protection, but are often invested in measures that merely maximise profit in the short term. On the contrary, if the government invests in flood protection instead of giving subsidies, firms will produce more and consequently earn higher profits in the long term. Flood protection allows for higher economic growth than direct subsidies to firms in flood risk areas. However, the best investment strategy may not be the same for each country. "Interestingly, from a macroeconomic point of view there are two scenarios, each with a different optimal solution," explains Grames. 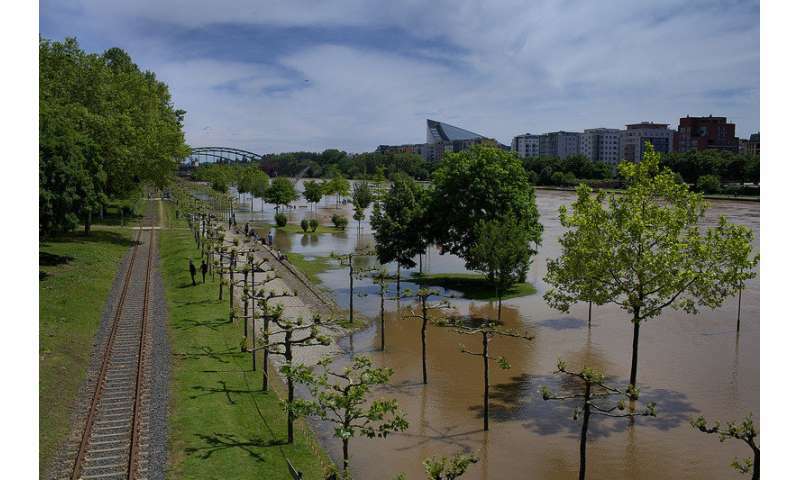 In rich economies, such as Austria or the Netherlands, substantial investments in flood protection are best to both reduce flood risk and enable economic growth. The existing technology and capital allow a significant reduction of flood risk. In poorer areas, such as the Mekong Delta in Vietnam, where there is very little capital available, it may make more economic sense to boost their economic performance and accept a degree of flood risk instead of pouring resources into flood protection measures which have very little success anyway. Johanna Grames says, "People can only make the right decisions if they have all the important facts at their disposal. We need transparency and education so that all parties involved can make rational, well-informed decisions, and this can only happen with interdisciplinary cooperation." Thus, a lot remains to be done in the research area of socio-hydrology in the future. How should flood risk assessments be done in a changing climate?